As I type this, the IYA 2009 has already begun in the Western Pacific while others still have to wait another 24 hours. A parallel blog (in German, but with the majority of links going to websites in English) has covered IYA preparations throughout the year in 70(!) postings; for starters check the latest IAU Press Release - and watch (on TV, maybe) the new year fireworks in Rio which will have an astronomy theme. While there are a few sky highlights in 2009, including some eclipses, there won't probably be that big event uniting humanity looking up. At least the old year ends - and new one begins - with a three-planet (and Moon) line-up in the evening skies. Dec. 31: This evening there is even a double conjunction with Venus & the Moon and Jupiter & Mercury pairing up; the latter pair is pretty close to the Sun, though. See below for the view on the past few evenings. Jan. 3: The Quadrantid meteors should peak around 12:50 UTC; the Moon is in first quarter. Jan. 7: At 3:45 UTC the U.S. Opening Ceremony of the IYA begins - and will be webcast (something that's not guaranteed for the international kick-off on Jan. 15/16 or other national kick-offs). Jan. 7: Jet another Pleijades occultation by the Moon for Europe, early in the evening. Jan. 14: Venus reaches greatest Eastern elongation, 47° (and the Stardust s/c flies by the Earth; EPOXI visited us on Dec. 29). Jan. 26: Annular eclipse of the Sun for SE Asia. Jan. 30: And again Venus visits the Moon. Pictures of the planets in the evening skies from several evenings, from Dec. 30 in Bavaria and Bonn, Dec. 29 in the U.S. (more), Austria, Würzburg, Hamburg and Japan (more and more pictures) and Dec. 28 from Colorado, Kansas, Arkansas and Europe. • Venus & Neptune on Dec. 28 and Venus close-up in the UV on Dec. 28 and Dec. 23 (more). • A "final numerical report" on Jupiter in 2007. • Meanwhile Saturn - with its rings nearly edge-on - has been imaged a lot: a fantastic collection and selected images of Dec. 28, Dec. 26 (more), Dec. 25, Dec. 24 (more), Dec. 22 and Dec. 20. • Finally some news about a Dark Sky Park in Scotland, a book on the 2008 TSE, nice pics of a green segment of the setting Sun, and pics & poems from the Romanian AstroTournament (and about comet McNaught 2 years ago) - plus splendid Hubble pics in large size. Happy new year! have appeared since the first summary appeared here - it was actually linked to in this summary. Picture collections include big ones here, here and here and smaller ones like this and this. Individual pictures published or found since are from Dec. 3 from India and Australia, from Dec. 2 from Germany (scroll down) and Australia and from Dec. 1 from the U.S. (where others just saw it or didn't), Europe (more) with videos from the Netherlands and Austria and pictures from Austria (more, more, more, more and more), Germany (where many saw nothing, though), N. Ireland, Scotland and England, from Morocco and India, namely Mumbai and the Old Fort in Delhi (incl. the next two elements and a multi-day-picture). And then there was this picture of Nov. 30 from Edwards AFB with the trio over Endeavour (just as it was seen that evening over LA). Originally NASA named this picture "The Setting Sun," and the caption claimed: "The setting sun casts long shadows over space shuttle Endeavour as technicians prepare to move the orbiter from the runway at Edwards Air Force Base where it landed Sunday, Nov. 30" - but how could one unmanipulated shot capture both the Sun and Venus and Jupiter? 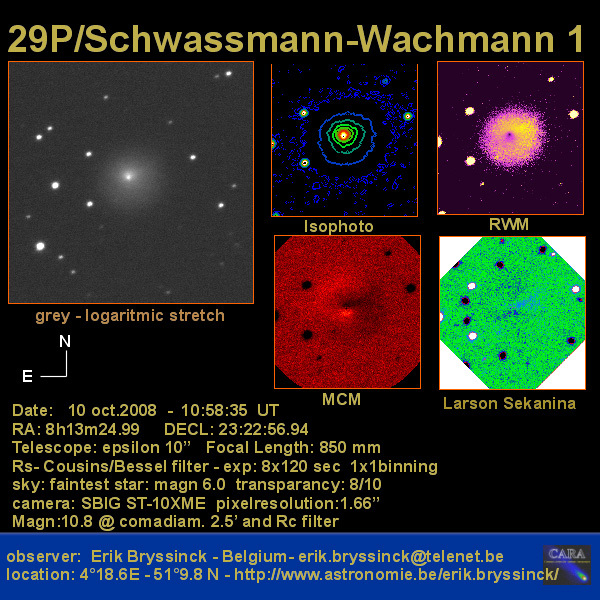 A big debate ensued on the German amateur astronomy mailing lists Astro and Planetenbeobachter where this blogger had raised questions about the image: First some claimed prematurely that such a picture would easily be possible "if you understood your camera" but the pictures they posted were in fact taken after sunset or poorly documented. 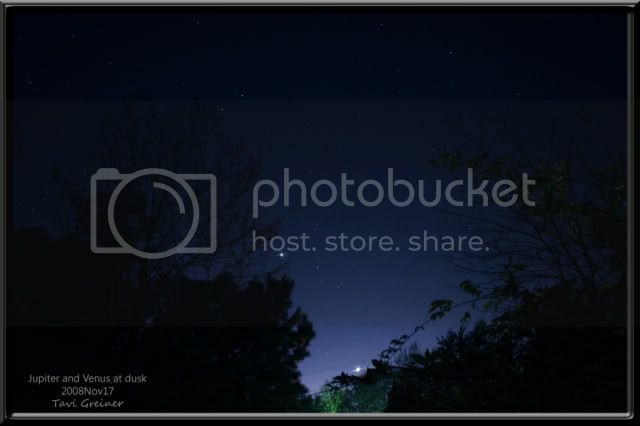 The triple conjunction of Venus, Jupiter and the Moon, seen in the evening hours around the world yesterday has been observed, photographed and commented on as hardly any such "simple" sky show before. In Australia and Asia the two planets and the lunar crescent formed a "smiley face" as many - even some media - have commented, while half a day later the Moon was on the other side of the planets' line and the smile was gone (though not from the faces of successful observers). The day before a German photographer captured the trio with some roe deer(! 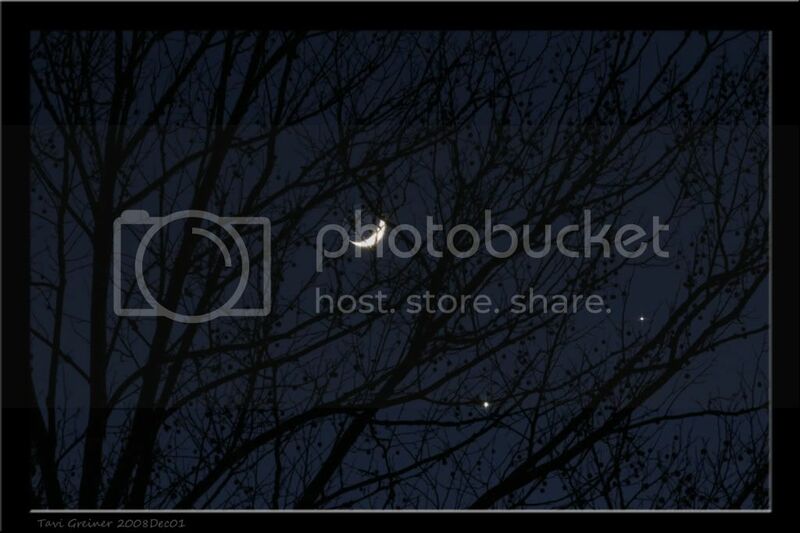 ); when dusk reached the U.S. the Moon was closer again. On December 1st Australia was greeted by above-mentioned smiley face in the sky: a big picture with the Galilean moons, more and more widefield views and experiences. In India the smiley was still present over battered Mumbai (from there more pics), a constellation much photographed (more and more scenic views). Despite ugly weather predictions, in Germany a number of people were successful (more, more, more, more and more results) as were many in Austria (very scenic shots; here are more, more, more and more results). In the U.S. the constellation was imaged even in daylight and then in dark skies (again with the Galilean moons); more, more, more, more and more pictures and impressions. First Jupiter and Venus crept closer towards each other and since yesterday the crescent Moon is joining the picture: going backwards in time, selected views from Germany, various locations and Australia on Nov. 30, the U.S., Germany, various places, Germany again and Australia on Nov. 29, various sites on Nov. 28, Germany, Austria and Australia on Nov. 27, the U.S. on Nov. 24 and Austria on Nov. 23 - celestial mechanics in action! And the best is to come tomorrow. Dec. 1: Close conjunction of Jupiter, Venus and the Moon, as previewed here (with this, this, this and this preview N-America- and this one Australia-oriented). For Europe there will actually be an occultation of Venus by the Moon as previewed here, here and here! 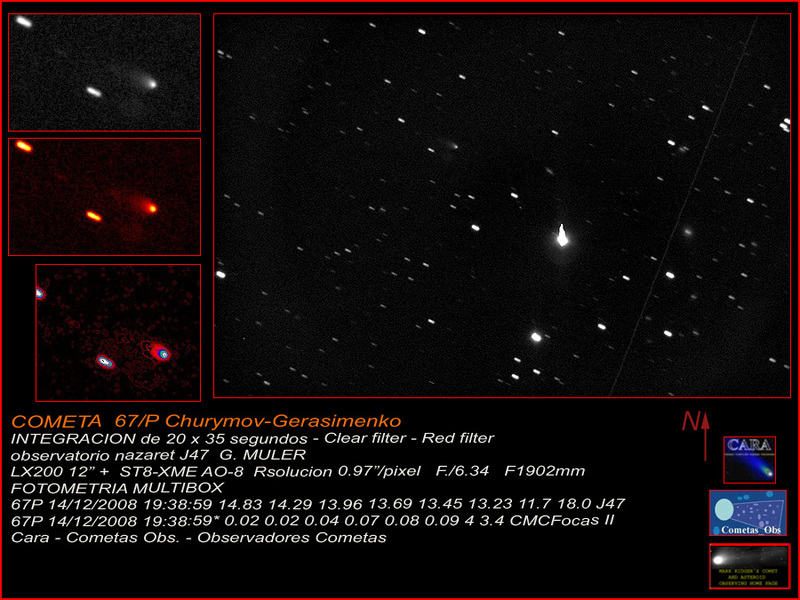 Dec. 4/5: Comet C/2008 T2 (Cardinal) approaches the North Pole of the sky to within 7 arc minutes! 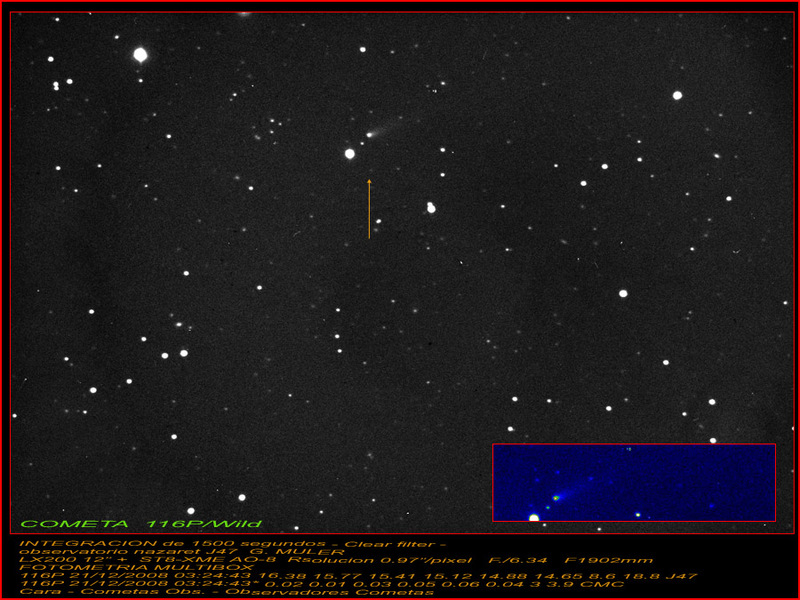 The comet is at about 13th magnitude. Dec. 7: The Trans-Neptunian Object (20,000) Varuna occults a star - with ongoing astrometry the predictions for the ground track have it now pretty stable cutting through the deep South Atlantic. Dec. 31: Jupiter will be 1.2° north of Mercury which is experiencing a minor evening visibility. Also Saturn's rings are almost seen from the edge. So much for the predictable highlights of Dec. 2008. In other news the first meteorites that fell after the well-documented Canadian bolide of Nov. 20 have been found and celebrated widely (see here and here and here and here and here and here for coverage and pictures). • Another Canadian bolide - and a rumbling sound in Wales. • According to at least one theorist the Leonids in 2009 could reach a ZHR of 500, i.e. 5 times the typical Perseids. Others haven't confirmed that yet. • Comet Borrelly with a long tail on Nov. 30. • Sometimes here true live images of comets can be seen. Major Canadian bolide on Nov. 20 documented by several videos! A dazzling meteor on the evening of Nov. 20 was "widely seen over a wide portion of the Canadian prairies, resulting not only in hundreds of eye-witness reports [like these] but some wonderful videos" like this one (also here), this and this one - and one shows that "the object broke into pieces. Some may have survived the explosion and have fallen to Earth where, with luck, searchers will find them as charred, blackened rocks sitting on the snow in a farmer’s field. The search is now on, first in narrowing down the fall area, followed by the field work, interviewing eyewitnesses, finding those who saw it fly overhead, and those who may have heard it. Then the real work begins — tramping winter fields looking for dark rocks that don’t belong." According to early analysis, "the object that entered the atmosphere had a mass of from 1 to 10 tonnes, likely as big as a chair to a desk in size. It fragmented in the large explosion everyone witnessed but reports suggest hundreds of meteorites could be on the ground, in an area near the Alberta-Saskatchewan border north of Provost and Macklin (110°W 52.6°N). 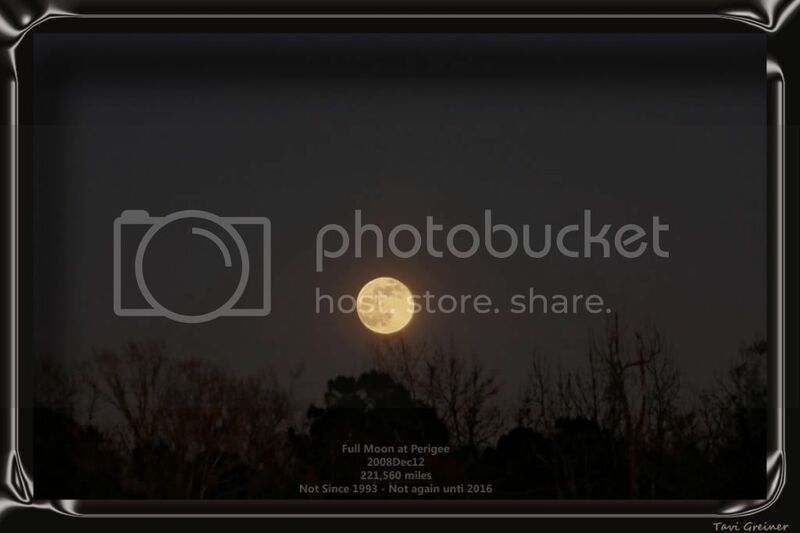 At peak brightness, the fireball reached about magnitude -20 — that's 600 times brighter than the Full Moon." Such a thing leaves ample trails on the web: Spaceget and SpaceWeather, e.g., link to the videos, Astroengine has stills, TransientSky, ScienceBlogs, BadAstronomy, UniverseToday, NASA Watch and ROG report as do CBC, MSNBC and SPIEGEL. The Leonids of 2008 did produce one major peak with a ZHR approaching 100 but not two as was also predicted for these meteors (always good for a headline). Here and here are some images, here, here and here reports. • Many comets on Nov. 22, 17P/Holmes on Nov. 23 and Nov. 6 and 68P/Klemola at Messier 17. • Various links about a stellar occultation by TNO Varuna on Dec. 7, a very rare event: Other than by Pluto no stellar occultation has ever been recorded by a Kuiper Belt Object. The full Moon at/in front of Messier 45 on Nov. 13, also seen here and here and here - and its waning crescent on Nov. 23. 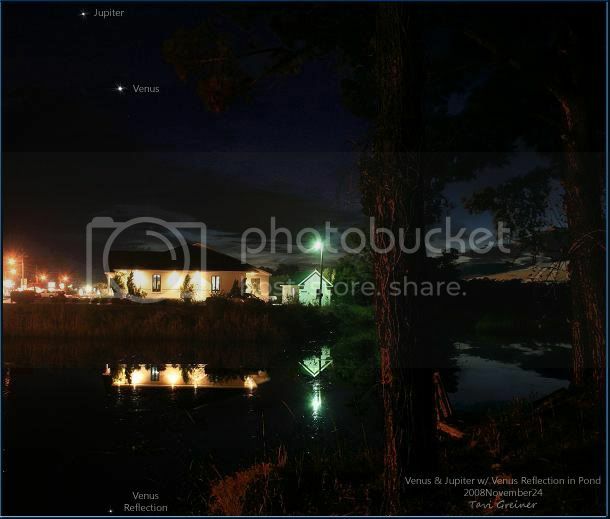 Venus and Jupiter are approaching each other, one week before a tight conjunction also involving the Moon. Views from Nov. 23 (more), Nov. 20 and Nov. 17, plus the view from down under and daily previews. • Rhea's shadow on Saturn. • The aurora from a plane. • A collection of corona images. And finally some good news out of the bad: The San Fernando Observatory - which this blogger visited last year - survived the big fire of Sylmar (at the Northern periphery of Los Angeles). "The observatory is fine, although we did have fire in the surrounding shrubbery," CSUN's Angie Cookson told this blog on Nov. 17: "None of the buildings sustained damage and we just have to deal with cleaning up ash and soot. The fires have been (and continue to be) just devastating. Driving from home this morning and looking at the burned areas, I was amazed that more homes weren't lost. The firemen truly do an incredible job." The Pleiades occultation tonight will be tough to observe because the Moon is full and its glare will outshine the stars of the cluster. • The occultation of Neptune a week ago seems to have been lost to clouds, at least in the U.K. In other news Activity region #1008 remains on the solar disk - here's yet another attempt to forecast future activity. • A new meteor monitoring system with two video cameras + fisheye lenses + automated software is now active. shower analysis. • Meanwhile questions have arisen whether the 2008 Taurids were really exceptional: Visual observations do not confirm more fireballs than usual, video data may support the idea. 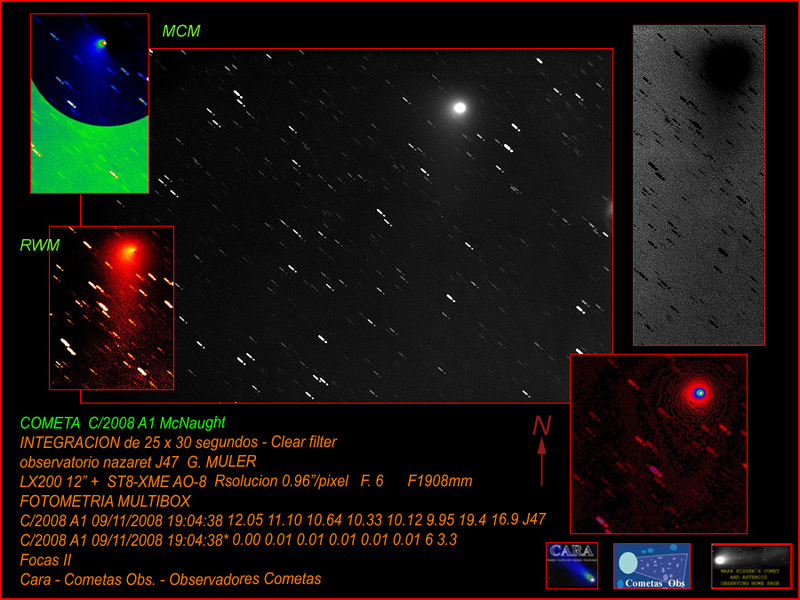 • Comet McNaught on Nov. 9 and on Nov. 3 at Messier 10, plus Cardinal animations. • A long review of the apparent fate of comet Boethin. • Possible changes on Eris are making some headlines. • Right after the next total solar eclipse in Shanghai next July there will be a comet conference (followed immediately by another one in Rio in August). Here are yet another story on the last TSE (and eclipse observations from the air in general) and related links. • A review of current - and mostly free - planetarium software (which I wouldn't call "virtual telescopes"). • And a 30 minute TV feature on light pollution. "Early in the evening of 6 November, observers in the north and west of the UK will have an opportunity (weather permitting) to observe an occultation of Neptune, while those in the south and east will see the planet close to the southern limb of the Moon," advises a Special Electronic News Bulletin of the Society for Popular Astronomy today: "The most interesting place to be is on the graze line, which crosses the country from SW to NE, from north Cornwall and north Devon, via south Wales, Stoke on Trent, Barnsley and York to Whitby on the North Sea coast. In the graze zone you may expect to see the planet dim and blink out several times as it is successively hidden and then reappears behind mountains on the Moon's dark southern limb. After leaving England, the graze line continues towards the NE following the coastline of Norway." The SPA has "produced a map showing the graze line crossing the country [i.e. the U.K.], and another showing the position of the m(v) +7.9 planet in relation to the gibbous waxing Moon's dark limb at the time. [...] Approximate times (UT) of the grazing event for various UK places on the line are as follows [...]: Lizard Point 18:44, Barnstaple 18:46, Lynmouth 18:48, St Brides (S. Wales coast) 18:49, Brecon 18:50, Stoke on Trent 18:51, Barnsley 18:52, York 18:53, Whitby 18:54. The altitude and azimuth of the event are about 22 and 183 degrees respectively, and the Moon's age is 8.8 days. The next UK lunar occultation of Neptune is not until 2016 June 25 at around 23:55 UT." A website from Austria provides further information on the rare event, including an interactive map. In other news the motions of Venus, Jupiter and the Moon in the evening sky have been amply documented on Nov. 3 (dito), Nov. 2 (dito), Nov. 1, Oct. 31 (from Kansas) and Oct. 30 (from Fla.). • Farther away some changes on Uranus, as compared to 2007. • Comet McNaught is currently close to globular cluster Messier 10, making for nice pictures and stories (In Czech) as well as some confusion (that was cleared up almost instantaneously). Also 29P on Nov. 4 and a nice - though not current - 17P animation. • Amateur astronomers at the Chabot Space & Science Center in California are using one of their telescopes for asteroid follow-up observations which are as important as new discoveries. • A fat but late Orionid from Oct. 31. • A heavy peace of the ISS jettisoned some time ago has reentered over a remote ocean, and thus its demise remained unobserved. 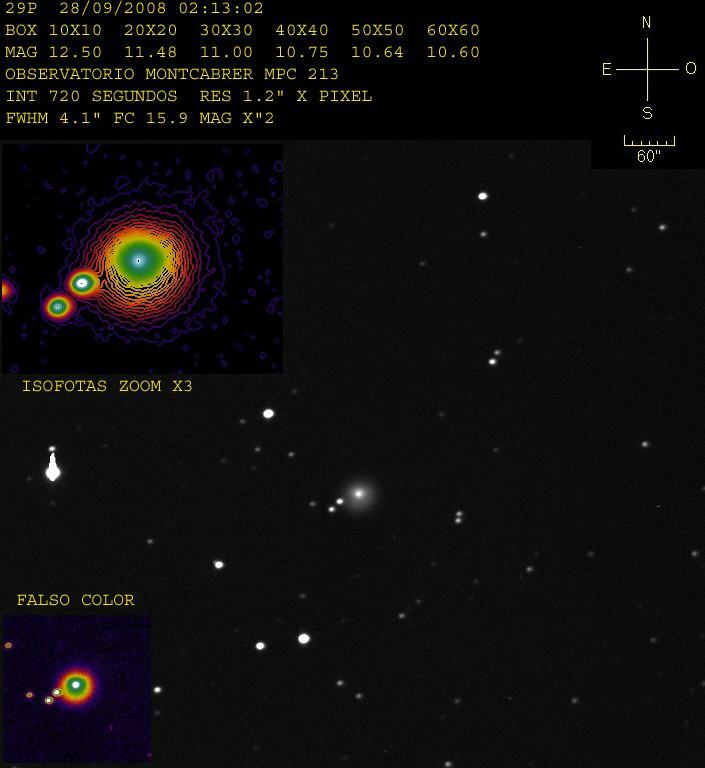 • Atmospheric gravity waves can be studied via the airglow, and the moving patterns have been imaged by amateurs in 2007 and again now. • A stunning view of the Milky Way while even the military hates light pollution which is actually going down in New York City somewhat. • A simple online planetarium, an online tutorial of the night sky - and an illustrated observing report from high in the Alps from the Edelweißspitze. Today and in the following days there are some nice nice line-ups of planets and the Moon in the evening sky, but two of the November highlights, yet another Pleijades occultation and the Leonid meteors, are largely drowned in Moonlight. So, to spice up the list a little bit, Oct. 31 and Dec. 1 are included as well. Oct. 31: Another close encounter with Enceladus for Cassini; the team is again blogging about the experience. Nov. 6: The (first-quarter) Moon only 0.2° from Neptune in the evening (at least as seen from Germany). Nov. 8: Orbit insertion for Chandrayaan 1 after a complicated trajectory to the Moon. Nov. 13: The full Moon occults the Pleijades for Europe - that will be tough to watch, even with binoculars. Nov. 17 (at 1:32 or 0:22 UTC) and perhaps also Nov. 18 (at 21:38 UTC): Two possibilities or just one for 100 Leonid meteors per hour and perhaps even more - but the waning gibbous Moon will interfere heavily. Dec. 1: The Moon occults Venus, for Europe in the late early evening. And Jupiter will be just 2° away. In other news a fireball as bright as the full Moon was imaged on Oct. 29 over Colorado and has been seen widely (more and more reports). • There is also talk about a moderately fresh impact crater in Alberta, CA. • There will be mutual events of Namaka and Haumea for several more years, thanks to the other moon of the dwarf planet. 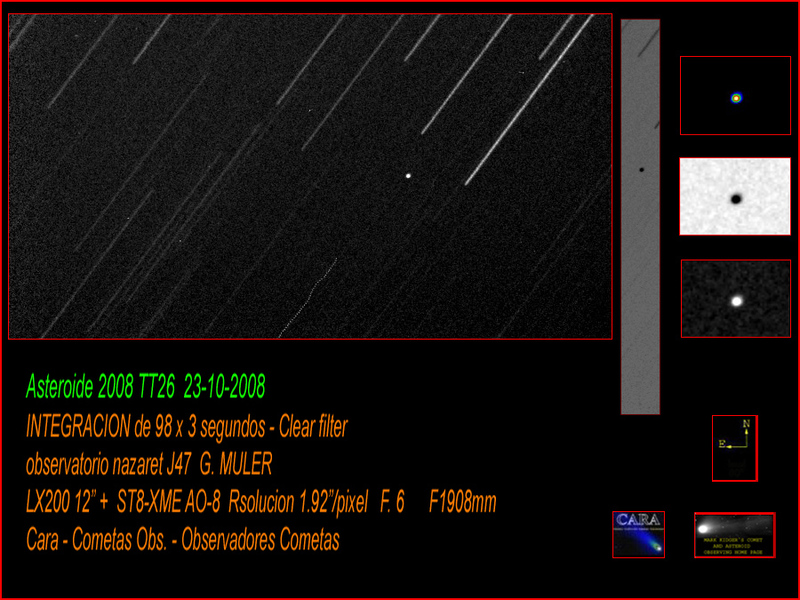 • Here are comet C/2008 A1 on Oct. 18 and 29P on Oct. 27. • A quickly varying white dwarf, HL Tau 76. • One can watch aurorae on the web - and still Kasatochi stuff in the atmosphere. They are probably the most eagerly awaited websites for the international eclipse chasing (and catching!) community: the detailled weather statitics and analyses Canadian meteorologist Jay Anderson prepares for all upcoming total and annular solar eclipses. Many a tour or expedition has been planned on the basis of these data and graphs - and it won't be different for 2010 when two intriguing eclipses will pass over the Indian and Pacific Oceans, the longest annular one until 3043 and a pretty long total one mainly hitting tiny remote islands. For ASE 2010 the wx stats along the track are stunning, with a deep minimum of cloudiness hardly ever seen in such graphs ... in Birma/Burma/Myanmar which promises up to 95% chances for clear skies! Now they claim to be prepared for visitors, others disagree, and the debate whether to go there has been going on for decades. Runners-up weatherwise (with 80% hope for clear skies) are SW China - and the coast of Kenya, touristically well advanced. For the TSE 2010 it's roughly 50:50 in the Cook Islands, French Polynesia and Easter Island, with Polynesia somewhat ahead at 55% clear skies (but hardly any solid ground, only remote atolls); South America - at sunset - has prospects far worse. In other news it took a while for the Orionids profile to stabilize; now a peak of these meteors around midnight Oct. 20 with a ZHR just below 40 seems likely. How the Orionids fared night after night can be seen in reports of Oct. 20, Oct. 21, Oct. 22, Oct. 23, Oct. 24, Oct. 25 and Oct. 26. • Videos of a Canadian fireball are being hailed as rare. • There is a nice resource on 2008 TC3 and its impact, esp. an analysis of the astrometric effort and an attempt on periodicities in the lightcurve. Elsewhere TC3's discoverer speaks on what it all means. • There is an unusual list of all potentially hazardous asteroids - for all terrestrial planets. • Following TC3 there were more close calls, e.g. by 2008 US. • And 2008 TT26 came within 3.5 lunar distances: a preview, another and more pictures - and a very periodic light curve with a 7 hr period. • Oh, and there apparently another megacryometeor incident, making headlines. 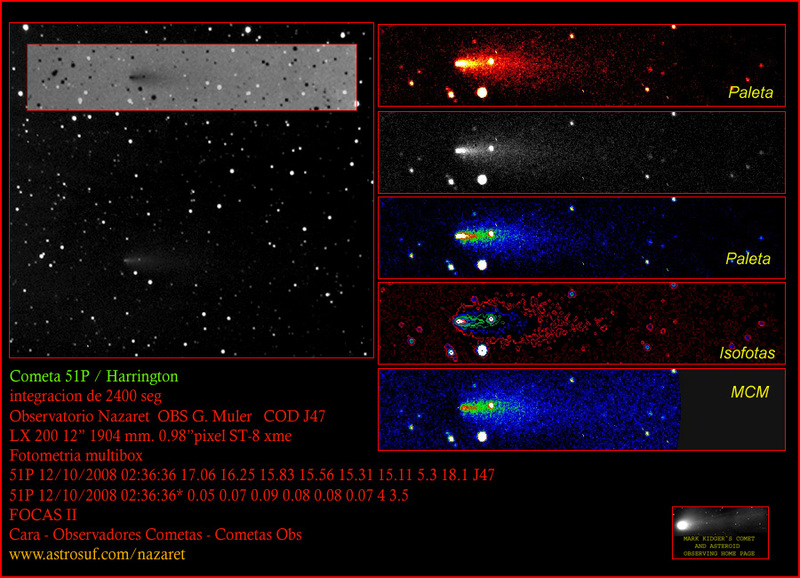 • It's now one year since comet Holmes brightened dramatically - yet checking the technical literature, there has shockingly little science come out of this breathtaking sky event (which was easily visible to the naked eye), including only about 3 attempts to understand what happened. • Meanwhile the current outburst of 29P is winding down. • Plus Rosetta-target 67P on Oct. 21 and Oct. 20. 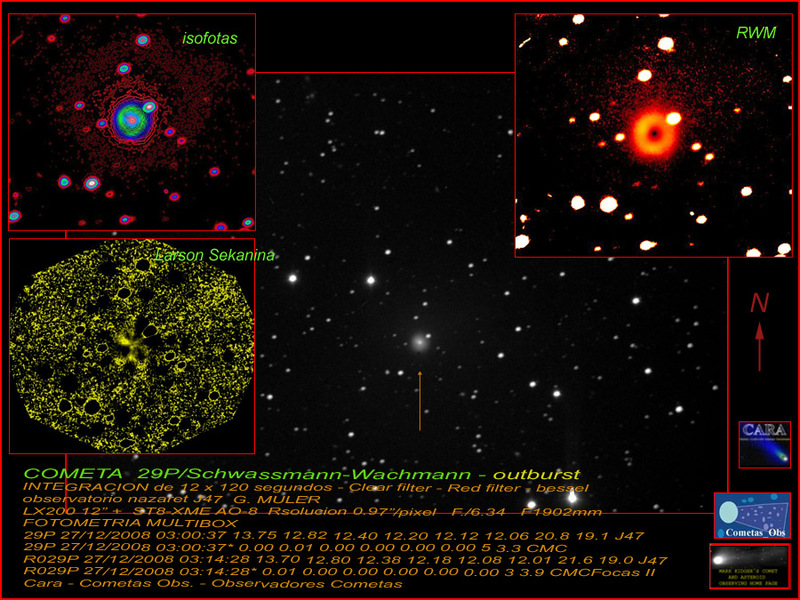 • Amateur astronomers played a role in recovering XMM-Newton after comm trouble. • NASA explains how the ATV reentry was observed. • A paper describes MCAO hi-res NIR imaging of Jupiter. 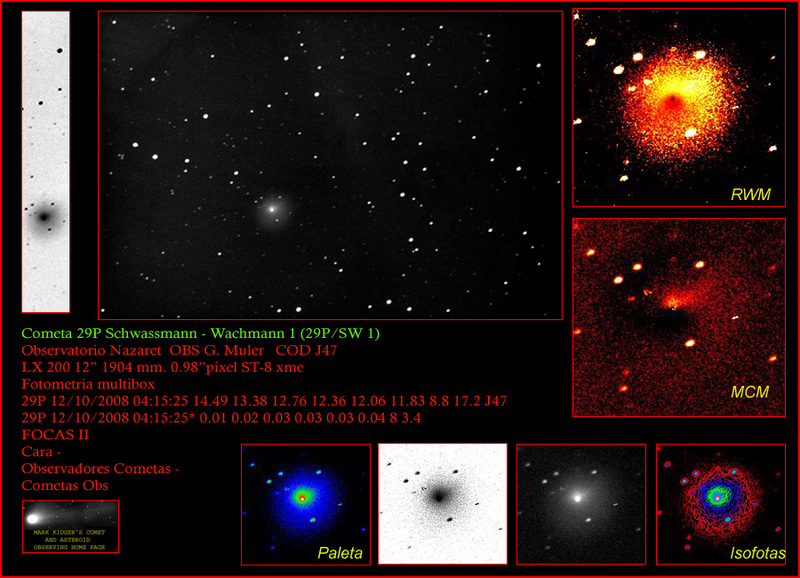 • A Spanish press release with nice galaxy images comes with a detailled explanation of the image processing. • And light pollution recently got a lot of press (here is the Nat'l Geographic package) - and has become a topic even in Hong Kong. European reports from the night Oct. 19/20 speak of a fine performance of the Orionid meteors in spite of lunar interference this year. The meteor rate already exceeds 40/hour (under assumed perfect viewing conditions), and the peak is expected only in the coming night. • Meanwhile a new analysis of the Leonids predicts a max. rate of 150 this year. • A detailled interview (ca. 10 min. 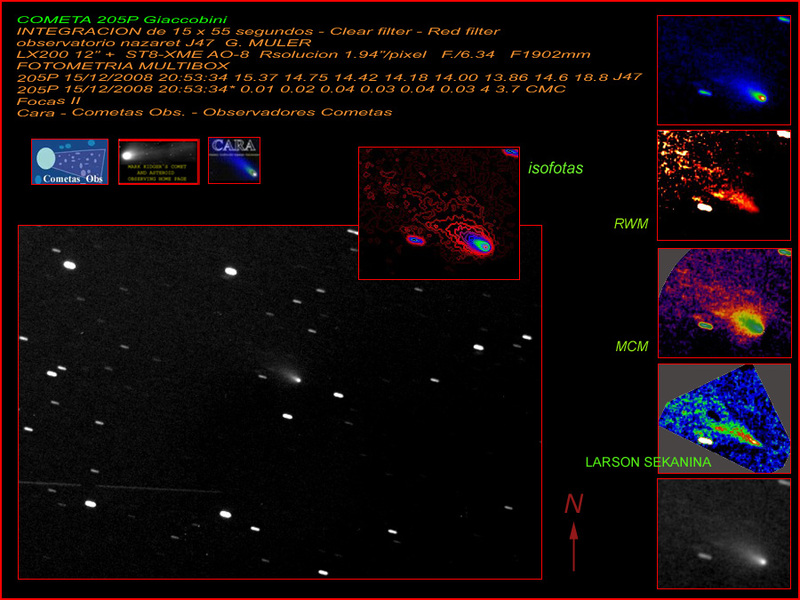 MP3) on the Jodrell Bank meteor system, with more background here. 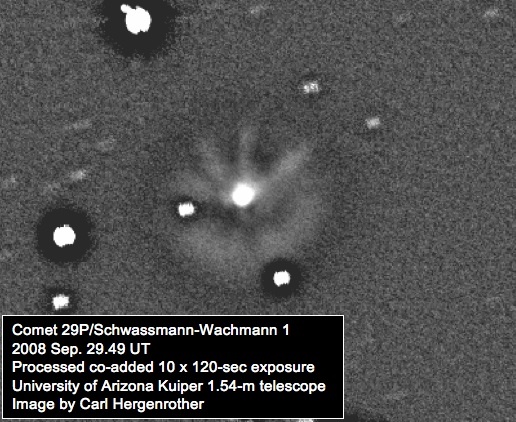 • A few more details of the 2008 TC3 bolide observations by a secret satellite - and also more on the indirect webcam observation: Reference observations near fullmoon show nothing, so the airburst must have been much brighter, even from 700+ km away! 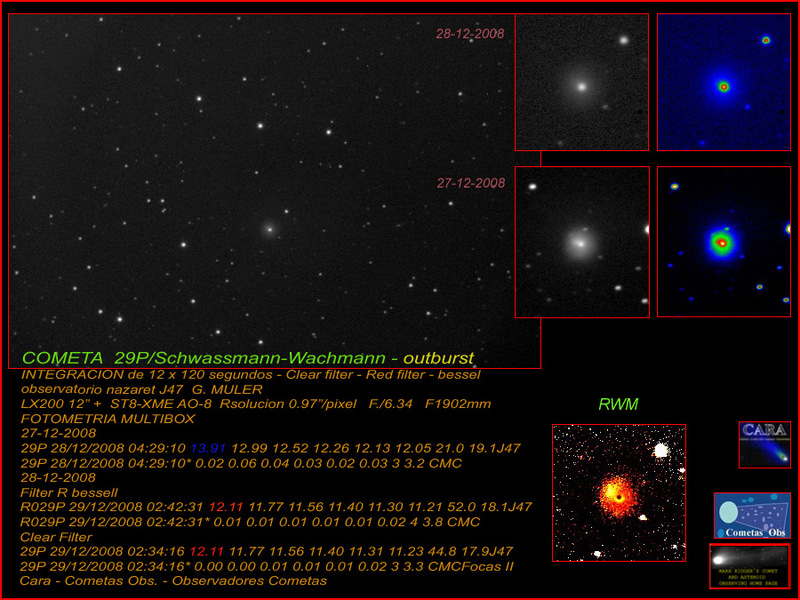 In other news a dwarf nova is in outburst for the 1st time since 1997, but only at 12 mag. • A supernova extinction record: 16 magnitudes! • The physics of the Deep Impact impact are still mysterious. • The discovery of comet Cardinal in Canada - which doesn't look like much - is spawning a press release ("only the second Canadian discovery of a comet, using a Canadian telescope, in nearly a decade") and news and blog coverage in the country. • Comet Tuttle is binary. • And the HST has observed Pallas, an asteroid of which one hears little. • A big prominence was seen on the Sun where STEREO imaged another one on Sep. 29. • Analysis of a flash spectrum obtained during the Aug. 1 eclipse - about which some 40 pages appear in TOTALITY! #8. • The German parliament held a hearing on light pollution with mixed responses. 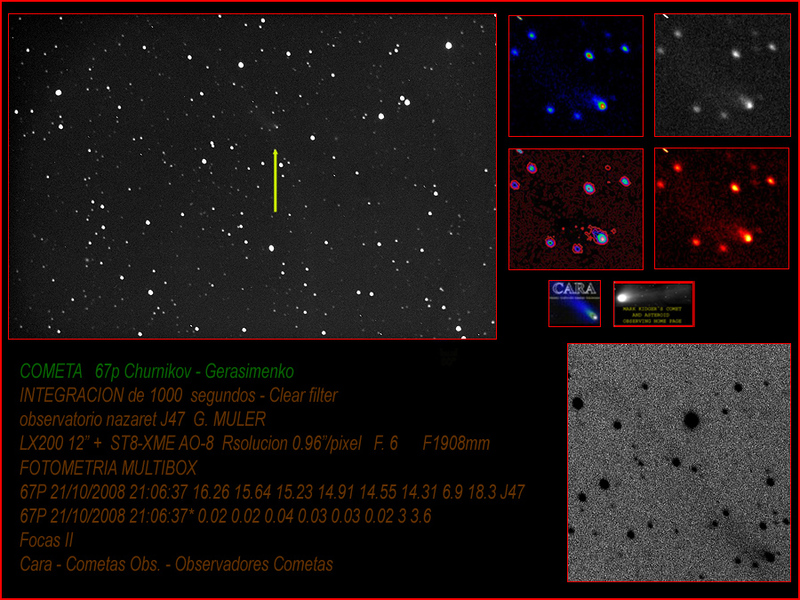 • Unusual radio images of our Moon can be seen here (under "ALMA Project News" as Fig. 5) - for comparision, the Moon at many other wavelengths. • Metals have been detected in NLCs, a possible clue to their formation. • And one should go to Canada for the best aurora views. 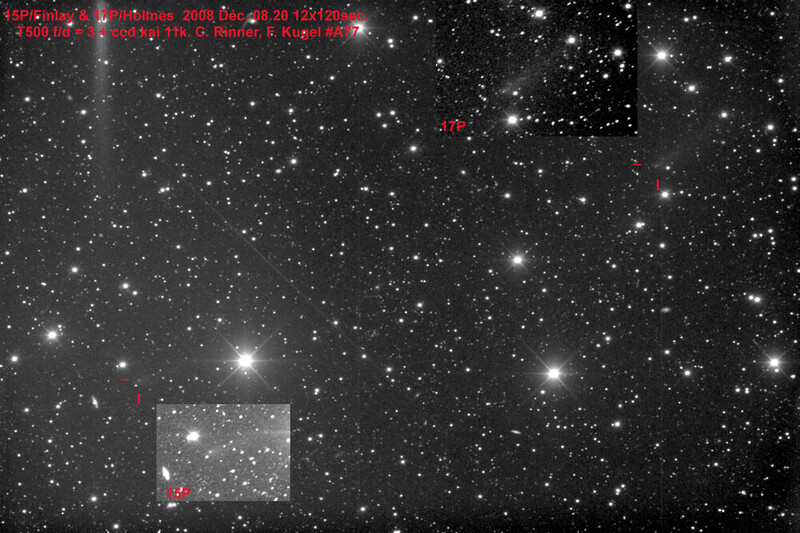 Already on Sep. 1, The Astronomer Electronic Circular #2478 had reported an "apparent brightening of V1647 Ori and its associated (McNeil's) nebula to mag about 16.7 on an unfiltered CCD image taken on Aug. 26.789 UT with a 0.60-m f/5.7 reflector," while "neither the variable star nor the associated nebula were visible" in January with a limiting mag. of 17.5. Now a picture of Oct. 12 shows the famous nebula practically as bright as in 2004 during its famous appearance out if nowhere (and discovery by an amateur astronomer). Observations followed in many wavelengths and a lot of papers were written e.g. about the bright state and the subsequent fading - now more can be learned about the eruptive variable star V1647 Orionis behind the show. In other news a new bipolar active region on the Sun (#1005) on Oct. 12 - and 21 hi-res pictures of the Sun at various wavelengths. • New Keck pictures of Uranus and its clouds and rings, yielding clues to that planet's seasons. 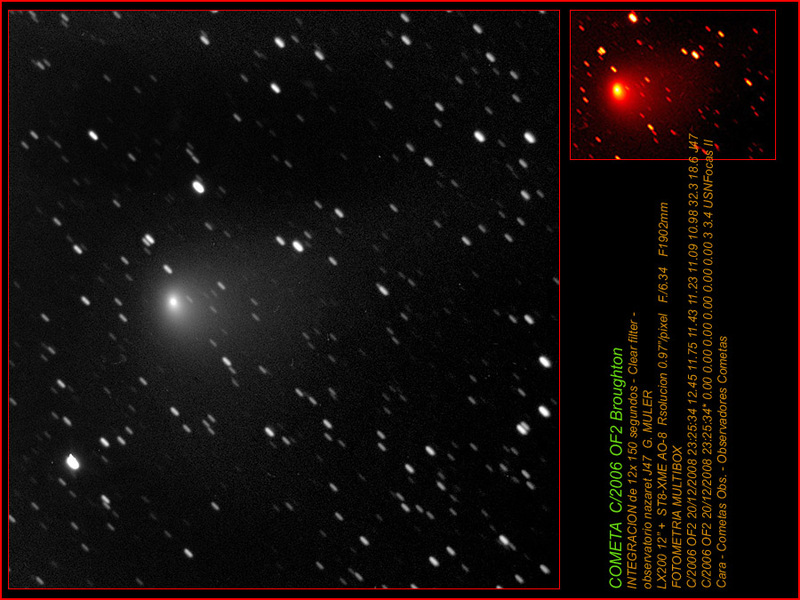 • Comet 29P on Oct. 12 and Oct. 10 and 51P on Oct. 12 and Oct. 10. 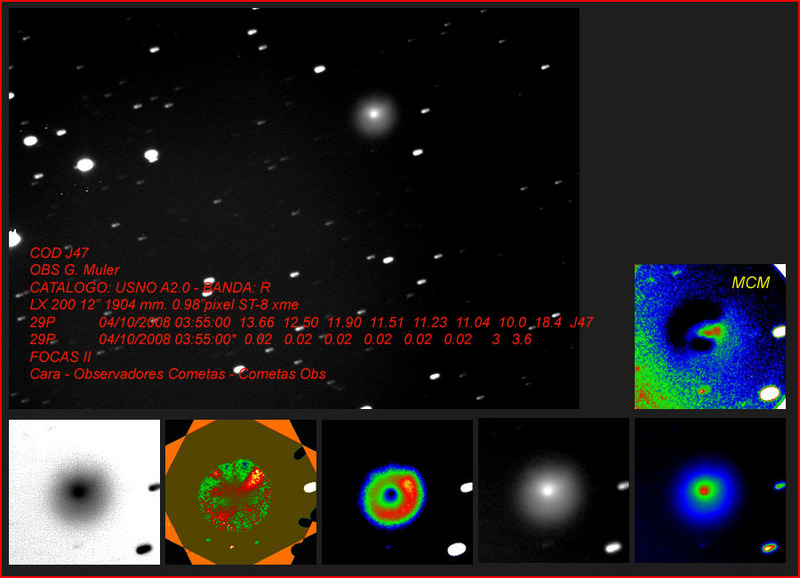 • The webcam images of the predicted bolide are back, together with some geometry. • We are still learning about the deep impact made by Deep Impact - and we will make the next one (on the Moon) next summer or fall with LCROSS. There is now a Meteosat image of the airburst over Sudan which "was visible in all 12 of the satellite's spectral channels, covering wavelengths from 0.5 to 14 microns" - and a webcam in Egypt showed how the ground was illuminated by the fairly distant explosion low on the horizon. (A website with screenshots is currently down.) Plus there is a cryptic notice by JPL about direct observations of the airburst that may refer to data from an early warning satellite (those are regularly detecting such bursts but rarely are the actual measurements shown). The case of 2008 TC3 is now being analyzed widely: What if this had been a bigger body which would have impacted the ground? This blog has already learned of a plan to set up an "official" website where the whole world can be watching how the impact probability ellipse on Earth will shrink and move as more astrometry comes in (and the response by observers this time has been huge). More video clips in sunlight are here, here and here: Some show a variation in brightness that may reveal the state of rotation of 2008 TC3 just hours before its demise. So far no report has come in from someone observing the airburst from the ground, no wonder given the remoteness of the area, but a few other detections have come in: an infrasound detection system in Kenya has seen a signal many minutes later that matches expectations very well, the crew of a distant airplane saw a flash at the right time - and there may even be a faint seismic signal, caused by the airwave coupling into the ground. There are also observations of the asteroid entering Earth's shadow, its rising brightness while approaching Earth and a video clip of its motion in the sky. New links are added here all the time. In other news images of comet 29P on the 6th and of all terrestrial planets on Sep. 20. • A detailled report from the 9. Herzberger Teleskoptreffen. • A new service for astronomical weather predictions for the whole planet. • And a New York Times editorial on light pollution. STOP PRESS: Mini-asteroid to burn up over Sudan tonight! "This is a first," David Morrison just wrote in his NEO News: "a very small asteroid (or rock) has been discovered that is on course for an impact tonight in Sudan. This information is from various reports posted to the Minor Planet Mailing List [the first message there being this; DF]. The impactor is only about 2 m across and will break up in the atmosphere, with no risk to those on the ground. (If something this size hit in the daytime, it would probably not be noticed, but at night it should put on quite show). 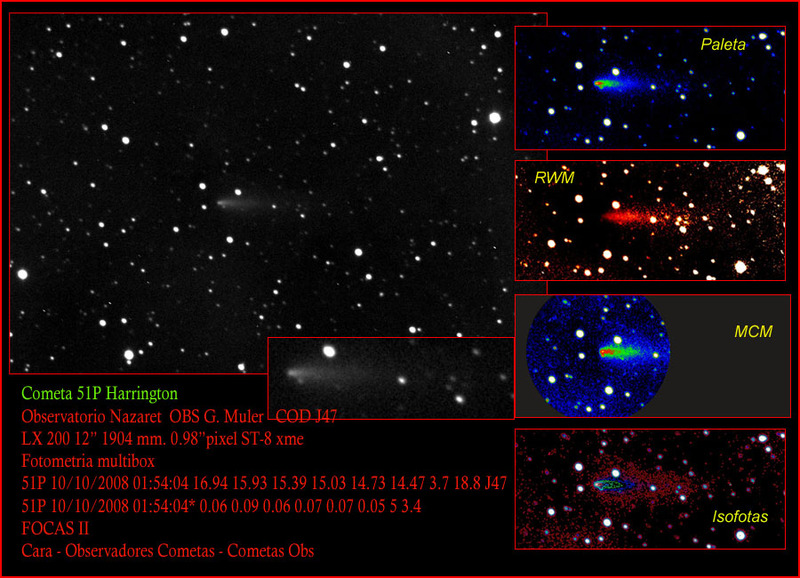 Alan Harris writes that this object, with the survey-assigned designation 8TA9D69 [and the current designation 2008 TC3; DF], was discovered by the University of Arizona Mt. Lemmon survey and will almost certainly, tonight, become the first impacting bolide discovered before entry into the Earth's atmosphere. Steve Chesley (JPL) reports that atmospheric entry will occur on 2008 Oct 07 0246 UTC over northern Sudan. 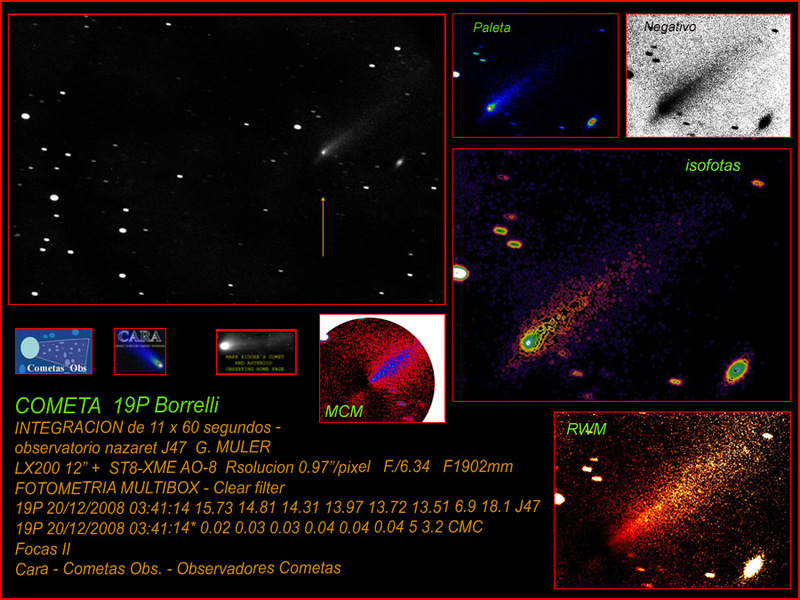 Andrea Milani of the University of Pisa wrote the following: Today the object with the provisional designation 8TA9D69 was submitted to impact monitoring by using the normal software of the NEODyS system, by using the observations as reported by the MPC on the NEO Confirmation Page. Based on 26 optical observations from 2008/10/06.278 to 2008/10/06, the probability of impact is between 99.8% and 100%; in practice the impact can be considered sure and is for tonight. Our computation has already been confirmed independently by others, including the JPL NEO Program Office (with which we consult in all relevant cases of possible impact). The effect of this atmospheric impact will be the release, in either a single shot or maybe a sequence of explosions, of about 1 kiloton of energy. This means that the damage on the ground is expected to be zero. The location of these explosions is not easy to predict due to the atmospheric braking effects. The only concern is that they might be interpreted as something else, that is man-made explosions. Thus in this case, the earlier the public worldwide is aware that this is a natural phenomenon, which involves no risk, the better. This is the first time an asteroid impact has been predicted, and it reflects the increasing capability of the Spaceguard Survey. There was one previous false alarm when, for a few hours around Christmas 2004, it appeared that an impact by a 30-m asteroid was possible, but this was ruled out by additional observations. The current case, however, seems much more solid." There are also a CfA Press Release on the impending airburst, numerous MPECs, this one being the first and this one the most recent, and a note from Switzerland. Oct. 6, 8:40 UTC: 2nd fly-by of MESSENGER at Mercury - here are a timeline, a preview and the latest approach picture taken today. Oct. 7, 9:45 UTC: The Nobel Prize for Physics will be announced - and there are some speculations on a possible astronomical winner. Oct. 19 to 29: Launch window for India's Chandrayaan Moon orbiter. Oct. 19, 19:02-05 UTC: Launch window for NASA's Interstellar Boundary Explorer (IBEX) which will be described in a telecon tomorrow. Oct. 21: Launch opportunity for the MIRIAM demonstrator of an amateur(!) Mars balloon. No joke! Oct. 27: Lauch date for GOCE, an ESA gravimetry mission. Oct. 30: Asteroid Vesta in opposition, reaching 6.5 mag. In other news dwarf planet king Mike Brown is no longer hunting, but there could be a few more large bodies out there. 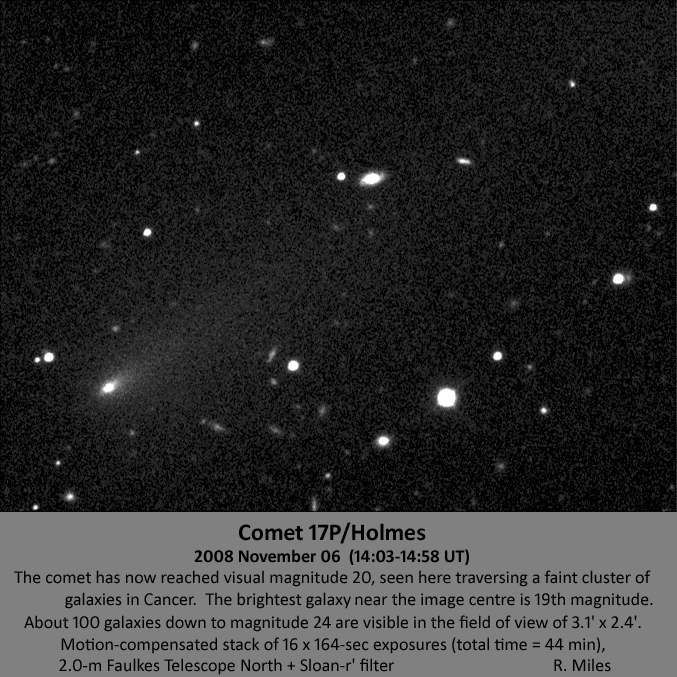 • A rare image of comet 17P/Holmes of October 2! • The recent outburst of comet 29P has triggered lots of observations: Here are a crude light curve and views of Oct. 4, Sep. 29 and Sep. 28. 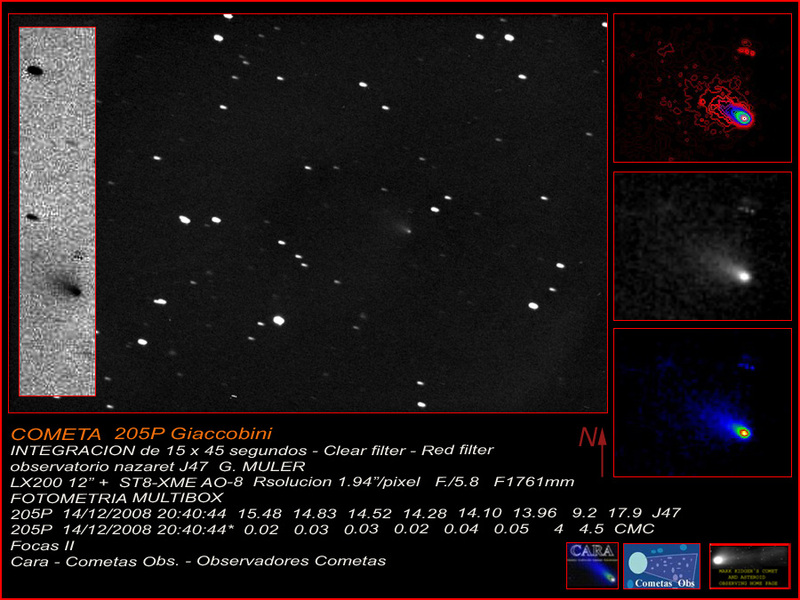 • 2007 N3 and 205P on Oct. 2, a new Boattini and yet another one, with low excentricity. 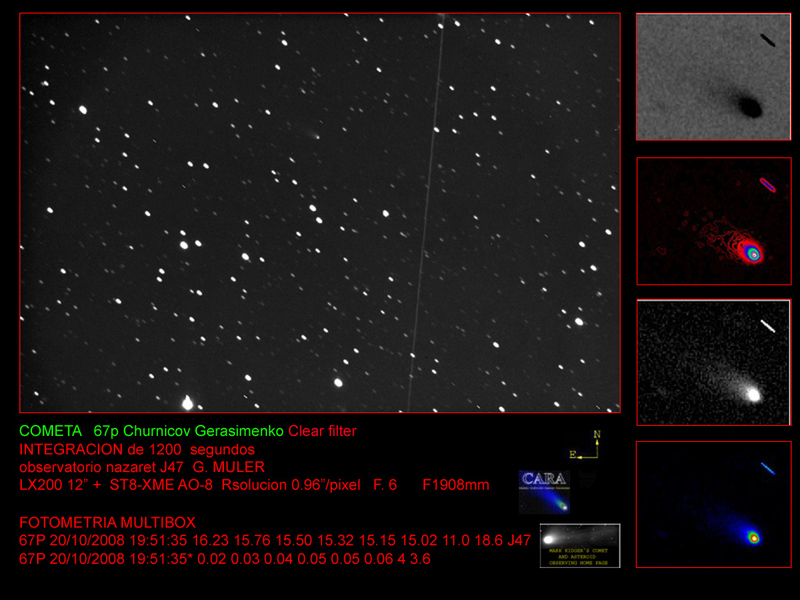 Plus many comets on Oct 4. • Is this the sharpest ground-based Jupiter, with high-end adaptive optics in the NIR? Compare this to, e.g. these or these amateur images of Jupiter with a vastly smaller scope. Plus motions of the Jovian moons. • The now-famous wide-angle image of the Aug 1. TSE also shows a faint distant Coronal Mass Ejection (clarified in the caption). There are also a new super-high resolution image (detail) and a view from a different location (also with higher magnification). • While another activity region has appeared on the Sun, a NASA story on the current minimum has caused widespread confusion (see also here, here and here) - using the statistical method described here would have avoided the troublesome 'spotfree' definition issue. Meanwhile a cool prominence was seen - and RHESSI data show minute variations in the Sun's oblateness with the cycle. In other news a meteoroid has grazed the upper atmosphere on Sep. 22 and vanished into interplanetary space again! This conclusion is based on just one video of the associated meteor and clever math. 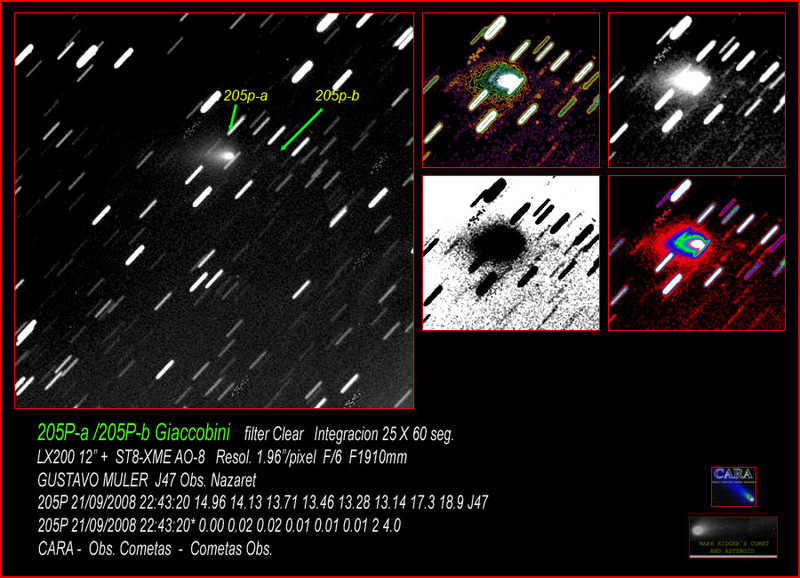 • Comet 205P/Giacobini with fragments a and b on Sep. 21. • The eclipse comet of 2008 in close-up and motion. This blog has learned, by the way, that there was yet another airplane going after the eclipse, this time from California - one of the Google founders had his plane going there, taking an astronomer with him (who can be seen in this picture sharing his eclipse video; no other details are known). Also more ground-based images taken right next to yours truly. And a Hinode X-ray image of the Feb. 7 eclipse, seen only as a partial one from orbit. • The ISS & ATV imaged recently in high resolution - the latter will reenter on Sep. 29, and a major campaign is underway to observe the reentry from two airplanes. One of which is not an "Ames research aircraft", actually, but one of the Google planes mentioned above, a Gulfstream V full of portable astronomy equipment. ESA will blog about ATV's final hours. 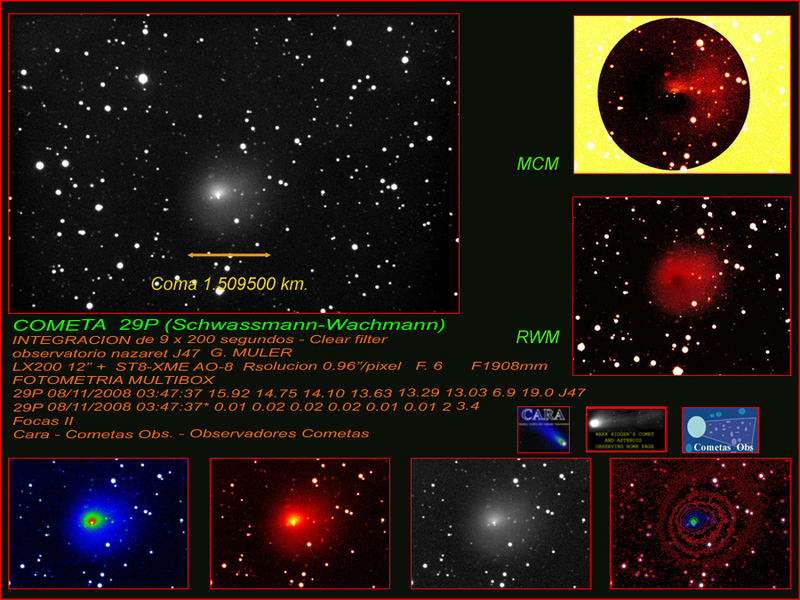 • And finally a paper on "SN 1987A's Wild Cousin" supernova 1996cr is making news now as "one of the nearest-known exploding stars of the last quarter-century" was nailed down with the help of lots of online archives. It's still 12 million light years away, though.